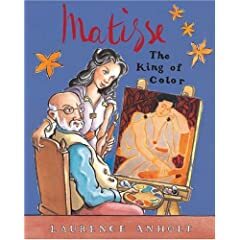 Laurence Anholt has done a beautiful job of telling the story of Matisse and his nurse, Monique, who became a nun, in a way that children can relate to and enjoy. Since I didn’t know anything about this artist, I also enjoyed getting to learn more about his personality and his art, too. While the illustrations were quite unique, I also loved the way that the author used typesetting to help ‘illustrate’ certain passages. During a passage about “diving in tropical lagoons and rowing on blue-green seas”, Anholt typesets the words in curves that go around the fish in the picture behind the words to hint at the motion of swimming and waves. But, more than anything, it was the story itself that captured both my attention and the attention of my six year old. There’s just something fascinating to me personally about an artist creating a chapel in a new and different way.